The University of the Philippines has released the schedule of the UP College Admission Test (UPCAT) this 2016. The entrance test is scheduled on September 18, 2016, according to the UPCAT official website. The scheduled entrance exam is for the Academic Year 2017-2018. The UPCAT is scheduled on September 18, 2016. The UPCAT is for students who are graduates of secondary school OR senior high school students expecting to graduate in 2017. Grade 10 students are not allowed to take the UPCAT yet since UP does not accept senior high school applications. Aside from the online application, UP is also offering a free online UPCAT review, a service for students who applied to take the test. They started the service last year to help applicants prepare for their test (Review Masters has a free online review since 2009 which you can access here). The UPCAT has 4 subtests: Language Proficiency (English and Filipino), Reading Comprehension (English and Filipino), Science and Mathematics. In the previous exams, the Filipino part of the two subtests were not formally announced by UP. This year however, they made a very clear pronouncement about the exam’s coverage. You may visit the official UPCAT website at https://upcatonline.up.edu.ph. Applications are accomplished online first then downloaded for printing. It’s a new system implemented by UP (although you may still do the manual method by getting a form from their office). Tara, I completely agree with your motto! Which is why I'm glad I figured a way to mitigate it. You know what's the best thing? We managed to make the trasnfers in the space of one day – just met after work and exchanged stuff. wala po bang senior high sa up diliman or other campuses? UP has senior high but it is only available to their UPIS students. Unlike Ateneo, UST and other colleges, UP does not have a standalone senior high. Pwede po bang mag UPCAT if 1st year college na ako sa FEU kasi gusto kong mag transfer sa UP kahit balik ulit 1st year? Yes you may transfer to UP but not through the UPCAT. There’s a different application process for transfer students who have already taken college units in other schools. Bawal po ba mag take ng UPCAT for AY 2017-2018 if nagtake po ako ng UPCAT last 2014 for AY 2015-2016 pero hindi naman po ako natanggap? Gusto ko po kasi talagang makapag-aral sa UP with the course of Accountancy. Though start na po ng classes namin this August 1 sa FEU, may chance po bang makapag transfer ako if napasa ko po ang UPCAT sa pasukan sa August 2017? Baket ho di pwede magtake ng UPCAT ang mga grade 10.Kung nag take po sila at dakaling pumasa college na po ba nun agad sila? Pwede po magtanong?! Kailan po next schedule for 2017-2018 entrance exam? at ilan pong students ang qualified para makapasok ng Grade 11? Hi! I’m still in Grade 11 but I want to know when will be the UPCAT for 2018-2019. Moreover, can I get an automatic scholarship if ever I will graduate with honors after my senior high school? Lastly, how will the subjects be on college? Will our previous subjects in senior high school be still there? (e.g. Oral Communication was already our subject in our Grade 11, am I still encountering this subject?) I would want to pursue a course related to Accountancy. The exam is scheduled every September. You must take the UPCAT on the month of September of your Grade 12. Be sure to prepare for the test during summer and submit the application around July- August. With regards to the subjects, we’re still not quite sure. There will be subjects, however, that you will still encounter that is the same in your senior high but in a more advanced level. Ang exam po ng UP ay naka-schedule tuwing Setyembre. Ang aplikasyon naman po ay tuwing Hulyo. Wala pa po tayong eksaktong petsa kung kailan. I-check nyo lang po palagi ang website natin para sa updates. Wow! Thanks for listening when God speaks. Your writing (God given and Holy Spirit delivered) speaks to so many he&a#srt8230; I feel like when HIS love is overflowing in me, it spills all over the place and that’s when people really listen! Not when my words are just my words… It seems that words are not enough. It’s the HOLY SPIRIT not only speaking but filling the air with HIS sweet fragrance. Allow HIM to fill you and HE will take care of the rest… Living water quenches thirsty hearts! Good Day! I just want to ask if I should take UPCAT for my second course? Thank You. Kailan po ba ang schedule for the UPCAT? 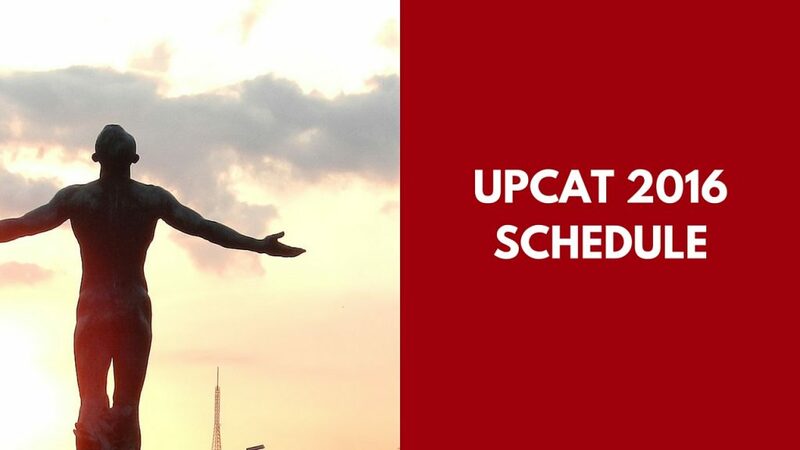 The UPCAT is schedule every September of the year. Hello. I’m am in Grade 11 and planning to take college in UP. I will graduate SHS in 2018. Am I too late for the UPCAT po? Hi. I was just wondering if there will be different admission exam for different academic strands, since there is the HUMSS, STEM, ABM, and GAS, will the admission exam still be the same, or not? lastly, I’m in HUMSS strand, but i wanna to pursue BS Biology, will it be okay, or do I have to take the lacking subjects? When can my daughter apply for a U.P.college freshman entrance exams for school year 2017-2018.. she will be finishing Grade 12 this 2017. Pls guide me . kailan po magrerelease ang UP ng requirements and form/s for transferring for s.y.2017-2018? Good day po mam/sir. how about here in Palawan, can we take an examination,too? at saan po pwedeng mag take ng UPCAT? Senior High School (Incoming grade 12 student) po ako ngayon and may balak po akong mag UP sa college . Kailan po dapat ako magtake ng UPCAT ? Ask ko lang po wen po yung schedule nyo for entrance exam for first year college.gagraduate po kasi anak ko sa senior hs on 2018. Good day! I was just wondering about the subjects that the shs will take in UPCAT for the S.Y. 2018-2019. Will the coverage still be: Language Proficiency (English and Filipino), Reading Comprehension (English and Filipino), Science and Mathematics? Thank you very much. God bless! ask ko lang po kung kailan ako pwede mag take ng upcat. I am now grade 12 this coming school year. Kailan po ang schedule ng application and take ng exams. Thank you for your reply. Hello po! When po ang schedule ng application and upcat this year? Hoping for your response. Thank you po. Just like to ask if pwede po ba ako makapag-aral sa UP taking other course? I am already a college graduate with a bachelor’s degree and plan to study again for a 2 years course in midwifery for SY 2018-2019 . Kelangan ko pa po ba magtake ng UPCAT ? At kung sakali ano po ang mga requirements? Good evening. Kelan na po upcat test for this year po? supposed to graduate 2018.
tanong ko lang po, depende po ba sa kukunin mong course yung i eexam mo sa upcat? Hi po. Kung gusto po bang ma-exempt sa test fee na 450, maari po bang magpasa ng receipt muna ng BIR/ITR kung hindi pa dumadating ‘yung mismong certification?